Although claims for injuries arising from motor vehicle accidents are now usually dealt with in the Civil Resolution Tribunal, the BC Provincial Court generally deals with other civil claims up to $35,000. You can make a claim for more than that in our Small Claims court, but if you do you must abandon the amount over $35,000. A Provincial Court judge cannot award you more than $35,000 plus interest and expenses (although contractual interest may be included in the $35,000 limit). These cases may be called “Small Claims” but we know how important they are to the people involved, and the sums of money in dispute are often not small. 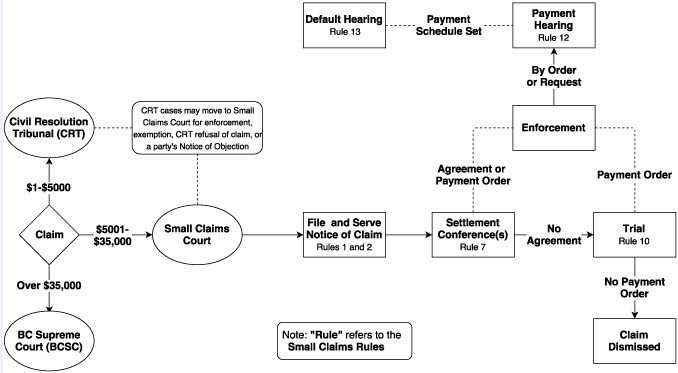 Small Claims Court procedures are set out in the Small Claims Rules. They are designed to be simple so people can feel comfortable coming to court without a lawyer if they don’t have one. However, consulting a lawyer can be very helpful. Some lawyers now provide “unbundled” services, helping you develop a plan to prepare and present your case and doing only the tasks you hire them for. At a minimum, a lawyer can tell you what you need to prove to establish your claim or defence, and advise you on the evidence you’ll need. For ways to get legal advice or find a lawyer see Getting a lawyer or legal advice. If you do not have a lawyer you may find it helpful to bring a trusted friend or family member with you to provide emotional support, take notes, and organize documents at your Small Claims trial. The Provincial Court has adopted Support Person Guidelines that explain when you are permitted to have a support person help you, and what they can do. For more information on Support Persons see this eNews article and poster. You generally begin your Provincial Court Small Claims appearances by attending a settlement conference with a judge. If you can settle your dispute there you need not return to court. If you are not able to settle, you may be required to attend a trial conference to make sure everyone is prepared for trial. After that, you will be given a date for a trial, where a different judge will hear you and the other party and any relevant witnesses you bring to court, and make a decision based on the evidence presented in the trial. See these Self Help Guides for tips on preparing for trial. To be successful in a Small Claims trial, a party must prove their claim or counterclaim “on the balance of probabilities”. This means they must prove their claim is more likely to be true than the other party’s version). After considering the evidence and the law, the trial judge may dismiss a claim that has not been proven, or make a payment order, or other type of order. If a person ordered to pay cannot do so immediately, the judge may order them to make monthly payments. This is called a ‘payment schedule’. If no payment schedule is ordered at the end of the trial, either party may ask for a ‘payment hearing’ to get a payment schedule. If the person ordered to pay does not obey a payment schedule, the other party may request a ‘default hearing’. It’s often not necessary to take a dispute to court in order to resolve it. The Peoples Law School offers step-by-step guidance on working out every day legal problems with a question and answer service. The Civil Resolution Tribunal’s Solution Explorer also offers information and tools. Or try the free, secure, online negotiation services offered by Small Claims BC or a private mediator. If you can’t settle your claim this way you can still go to the CRT or to court, depending on the value of your claim.